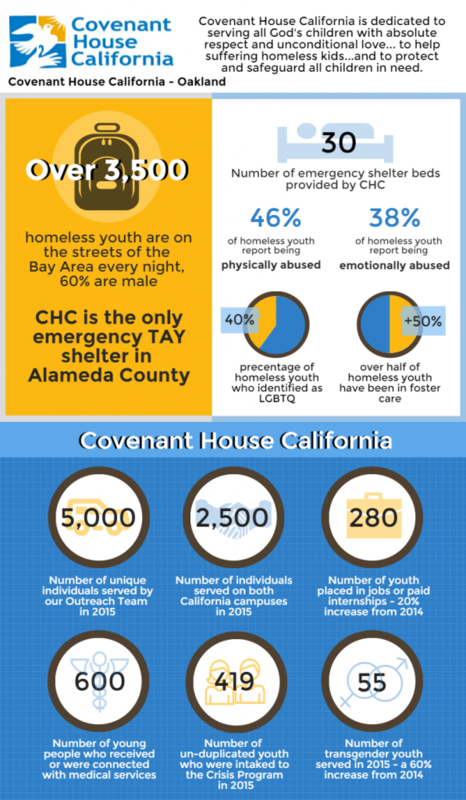 Covenant House California provides shelter and supportive services for homeless and trafficked youth. Give InKind spoke with Heather Flynn, a passionate and articulate advocate whose prolific knowledge is matched only by her kindness. Flynn describes one of many success stories. She speaks of a young woman who entered Covenant House as a homeless bereaved teenager. This young woman had always been an outstanding student. However, following the death of her mother, and in the absence of anyone able to take her in, she became homeless. When she entered Covenant House, she resumed her education. Eventually, she was graduated from Harvard University and now holds two advanced degrees. Covenant House serves homeless youth aged 18 to 24. It provides housing from emergency shelter all the way through to assistance with independent living accommodation. Along the way clients are provided with food, clothing, classes related to life skills, education, career placement, non-denominational spiritual guidance, mental health services, and more. Flynn says that many of their clients have aged out of the foster care system. She adds that 70% of those who age out of foster care are homeless within three months. (Children in foster care automatically stop receiving benefits when they reach the age of 18 years). Further, 40% of homeless youth identify as LGBTQ. Many clients have suffered abuse at the hands of their families or within the foster care system. Says Flynn, the goal of Covenant House is to provide individual residents with unconditional love and absolute respect. In-kind donations are central to the overall functioning of Covenant House. A large portion of their budget covers necessary items such as clothes, school supplies, personal care items, and more. Flynn explains that for every item they do not have to buy that money can be freed up to pay counselors, and invest in program. In other words, in-kind giving is far more impactful than is generally understood. Flynn’s goal is lofty. But lofty goals can be accomplished. History bears this out. It takes communities coming together to create a cohesive plan offering support to vulnerable populations who, when served, can be unstoppable. For more information, please visit Covenant House California.